The story of Churchill's so called "Secret Army" is becoming well known these days, after many years of being shrouded in secrecy. The story of the Auxiliary Units can be traced back to 1938, when Major Grand set up a section of the Foreign Office known as section D – its task ‘To investigate every possibility of attacking potential enemies by means other than the operations of military forces’. In 1940 the government, anxious about a potential German invasion, tasked Section D with setting up a British guerrilla force. 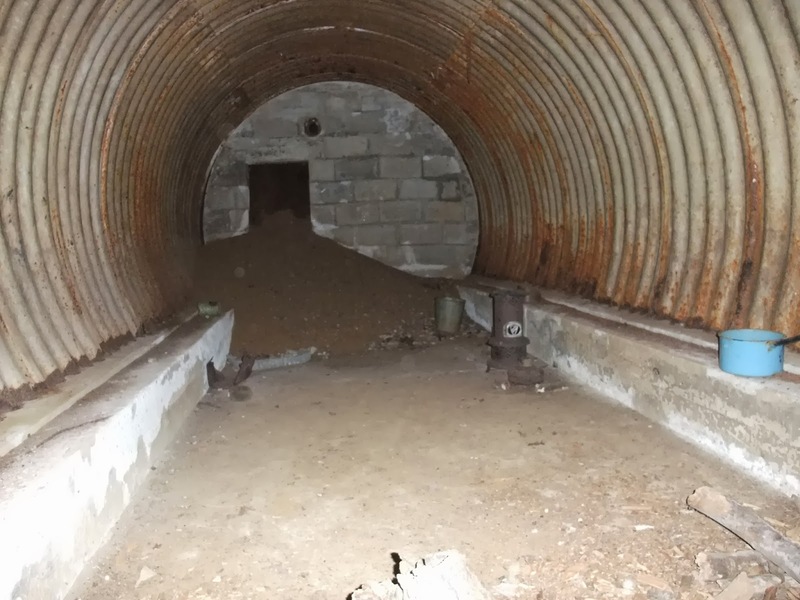 However due to lack of resources not much was done except hide dumps of explosives around Britain with the apparent hope that someone may use them to attack the enemy. The task of forming an underground army that would operate in the event of a German invasion was then given to Colonel Gubbins (who led his Independent Companies in Norway, which on withdrawal to Britain were formed into units called ‘Commandos’). This new underground army was organised within GHQ Home Forces and Ironside promised Col Gubbins whatever men and supplies he asked for. It was one of the best kept secrets of the war. The new units were called ‘Auxiliary Units’ – a name chosen because it was vague and would not create too much suspicion. The plan was to create Resistance units in a Coastal strip, no more than 30 miles wide, as any invasion force would be must vulnerable within the first few days of landing. The Units would go to ground on invasion and emerge to carry out attacks on occupying German forces. These units needed a hideout or "Operations Base" in which to go to ground. These were normally located in small isolated woods or copses. Most were based on the "cut and cover" form of dug out, either a simple elephant iron shelter or more complex constructions. Most were constructed by the Royal Engineers. 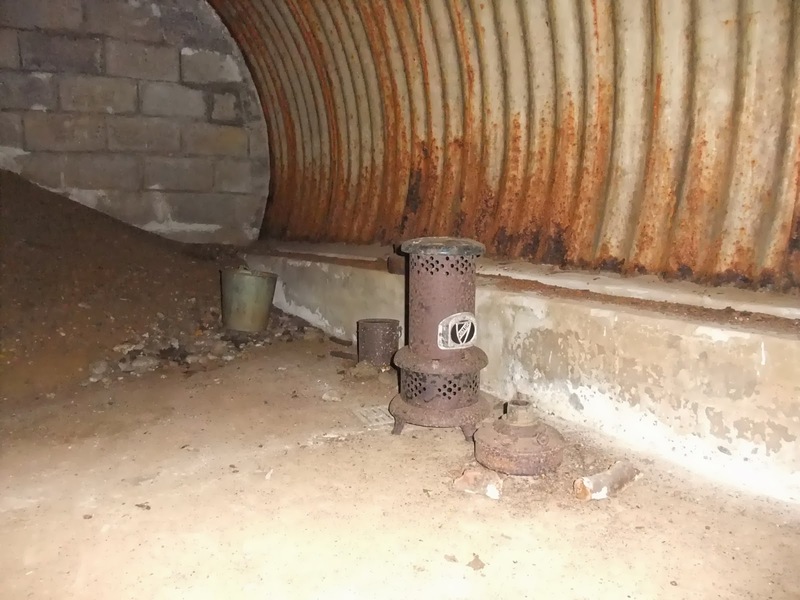 In these shelters would have been bunks, stocks of food, chemical toilets and small stores of ammunition; most of the ammunition / explosives was often stored in separate locations. The Wangford OB is a particularly well constructed hideout. 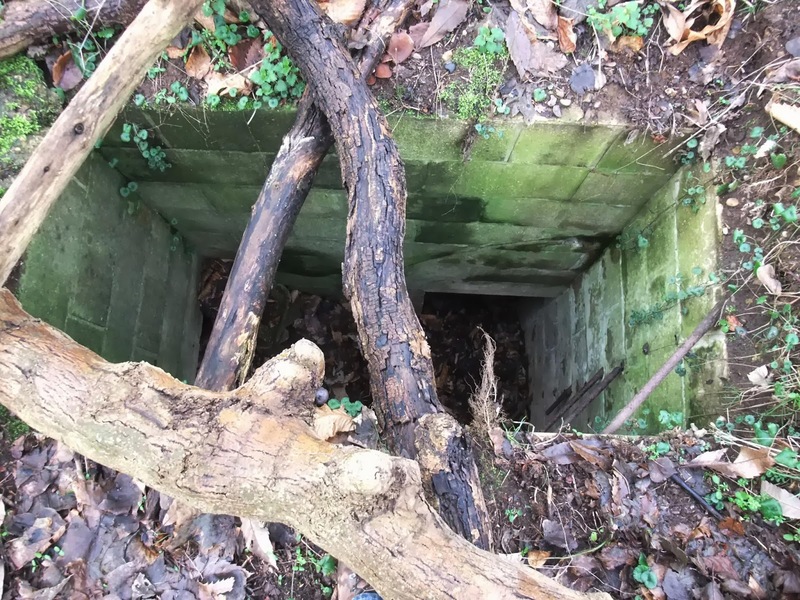 It consists of a sunken main entrance constructed from concrete blocks with iron an iron rung ladder for access. The main chamber is a classic elephant iron structure set on a concrete base. The emergency exit has collapsed. A Valor stove, bucket, some pans etc from the period still remain inside. Finally got round to recording Diver Battery T18 today. Not much remains - just a few concrete bases for huts and perhaps three out of the four gun pits. T18 was a HAA battery, i.e. 4 x 3.7" guns. 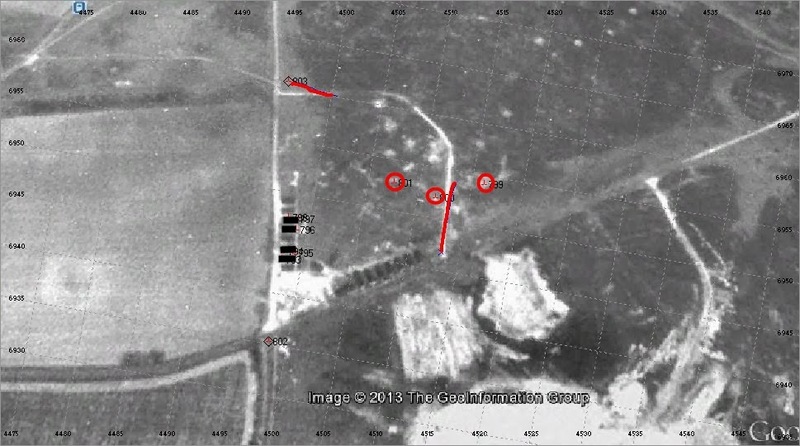 Above: 1945 aerial of T18 - the huts can still be clearly seen. I could only find the remains of four concrete bases for the huts, although others may still remain buried under the leaf litter or covered over by gorse scrub. 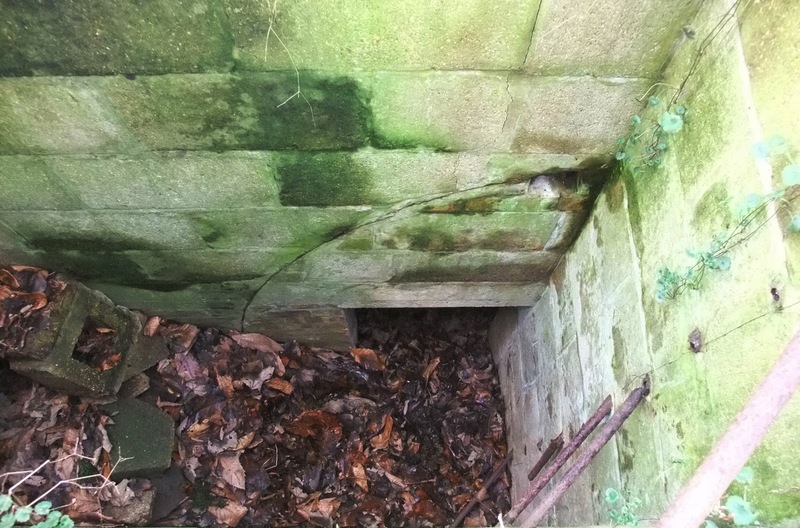 Above: Remains of a concrete base for a hut. Something I had not picked up before on my previous visits to this site was that the course of the Sommerfield track laid around the perimeter of the site can still be followed in places. 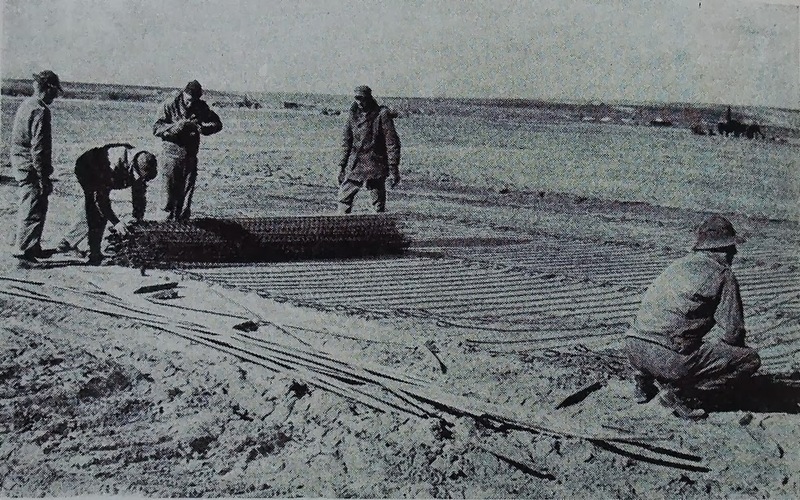 Sommerfield track consisted of 2 inch or three inch mesh netting reinforced with 3/4 inch mild steel rods at 8 inch centers. The track is joined longitudinally by buckles and transversely by linking bars held down by special angle iron pickets. It was supplied in rolls 25 yards long by 10ft 7ins wide. Above: Top image clearly shows where Sommerfield track was once laid. Note the circled angle iron picket used to hold down the track. Middle two images shows a pile of the angle iron pickets used to hold down Sommerfield track. The second image shows the group of pickets a couple of years back when the ground was much more open (following some heathland restoration work). 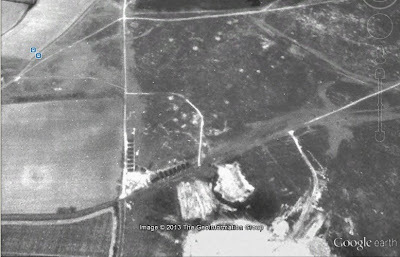 Bottom image shows Sommerfield track being laid for it's original intended purpose - a temporary runway for an airfield. Note the angle iron pickets. The gun pits provide a bit of a problem. Although they match the dimensions and spacing you would expect for the depression in which a Pile mattress would have been constructed to mount the guns on, they are not orientated in the direction you would expect given the Bonzo engagement arc for this battery was 30 deg to 170 deg (Bonzo was the code word for proximity fused shells). The guns should be placed at right angles to a line bisecting the Bonzo engagement arc i.e. aligned along a line 10 deg to 190 deg. Despite much searching there was no sign of a fourth pit. Above: GPS data calibrated onto the aerial photo of the battery. The remains of the four huts are shown in black, the course of the Sommerfield track in red and the three possible gun pits are the red circles. They are clearly no where near aligned along the line 10 deg to 190 deg. (Remember the layout for Diver guns was an inverted bow - see main website). Above: An image of each of the three pits. The diameter of the pits was approx 18-21 ft i.e. what you would expect for a pile mattress.